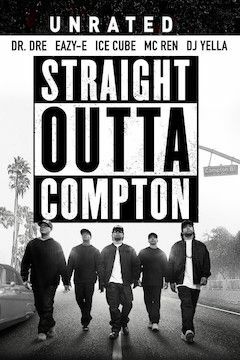 In 1987, five young men came together and began putting to music their harsh experiences and anger about life growing up in Compton, California -- the most dangerous place in America. The men who became known as Dr. Dre (Hawkins), Eazy-E (Mitchell), Ice Cube (Jackson Jr.), MC Ren (Hodge) and DJ Yella (Brown Jr.) fought back against the authorities that tried to keep them down and came to form the world’s most dangerous group, N.W.A. The group became a cultural and musical icon as they told the world the truth about life in the hood.